The targetted sections of children were the 3rd and 4th standard children, who will be introduced to formal English only in 5th standard. Amongst many constraints the sessions have recorded roughly 50% retention of words newly introduced over 12 sessions. 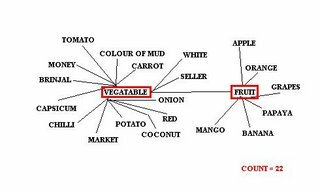 The emphasis is on the knowledge of the word, the phoenetics and the recoginition through the visual association with a picture. 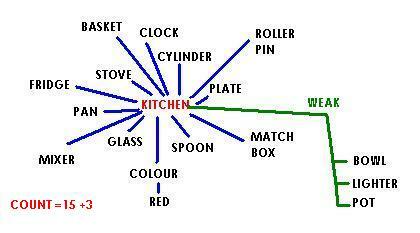 The alphabet and spelling are not introduced through the exercise. A cluster of 30 words may be built up. Of which 10 will be keywords that the Volunteers will ensure, get introduced and later assess for retention. The build up of the cluster is followed by a Individual activity like colouring / drawing. This is followed by kinesthetic activity where there is a representation of the activities that relate to the kitchen, like a a skit showing Mother "Cook" ing ... or the Child "Eat" ing or "Cut"ting of the vegetables, etc. 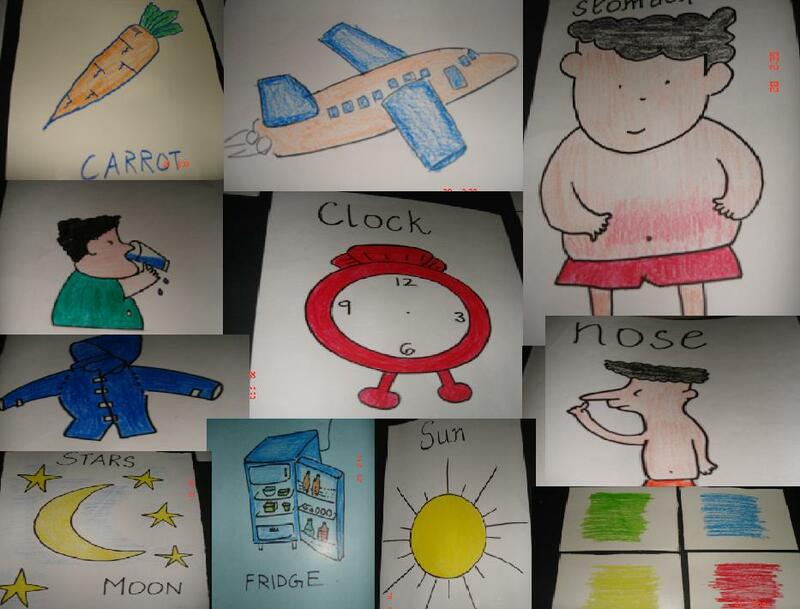 The pictures for our sessions were hand-made by our very committed Volunteer Pooja. There are books that have helped us derive examples for the clusters. An alternative to this would be transforming the images into PPTs, which was well accepted ( the children were quite excited about the Computer as much as the Camera), but the computers to student ratio might deter the exercise. The sessions have been on an experimental basis. Any volunteer group who would like to take this further into a new environment / school will be of great help. We need to identify what factors would ensure the success of the exercise through trial and error. And we really can't err that much. The exercise will definitely act as a supplement to the classroom learning. And as Juvena, our mentor for this whole exercise, points out, we can understand the constraints under which Teachers teach in classrooms and hopefully may motivate them to undertake new initiatives, by demonstrating success in the same environment that they function in. I sincerely thank every volunteer who has been with us in this commitment of a whole trimester. Fortunately the Govt is getting organised off late. http://www.schooleducation.kar.nic.in/ gives a lot of statistics on education in Karnataka. There are about 51,000 govt. schools in Karnataka and over 1300 in Bangalore URBAN itself !!! Also find lot of good statistics on http://www.azimpremjifoundation.org/html/statistics.htm There are many more such useful links - don't want to cram too much info here. I'll upload some other important files on the egroup soon. Medium of instruction...%age of schools with Kan, Tam, Urdu & English medium. I guess, not so easy to get them, but we should have these stats on our fingure tips.....helps a lot in a better understanding....and to attract new volunteers & funds......esp with NBD looming. Lets do our searches.....and put them up here. Can somebody also talk interms of budget allocation....centre & state.....what percentage...goes where......that would be GREAT. PS: This blog writing is more like a mail ;-)) I miss my pictures......wait...lemme attach one of my favourites. An earlier writeup of an NBD experience. Juvenile Home is a better euphemism. But still the old name lives in my head, and conjures a collage of images. Saturday, 30th July 05 - big day for many of us - for we had a logistic challenge/day-mare in our hands, 10 thousand notebooks to be distributed at 40 govt. schools. By 4pm, as an exhausted gang of us had an hungry lunch, our cluster of 10 schools were covered, and I guess almost all of us were thrilled with the experience. Post lunch, we seemed to have a couple of hours, and wondered what next ? Joining Sunand's gang for some more book distribution was not pragmatic (he was lost somewhere). Hiking to nearby hills formed by the mining slurry, near the entrance of KGF was an option. But, more appealing was a visit to a Remand/Juvenile home closeby. Notebook distribution amongst the kids was a pretext, we were keen on meeting the kids & getting to know the place. A 5 minute walk took us there, a big building invited us in, we see lot of kids wearing green shirts bunched with an old man. They were apparently doing some pooja(prayer) in a small temple - made up of a small slabs - The God's we didn't notice. But, was the kind of temple children build in minutes to play. A quick talk with the authorities, and they were happy to have us. This is an home for boyz. 66 boyz were present. Most of them seemed to be below 10 years, and just a few in highschool. A lady warden told us most of them are here for they are orphans. And left unsaid that the rest are sent by the police/judiciary. There seemed to be a lot of kids in 1st/2nd standard. They all had short cropped hair, and sat very obediantly. Looking back that strikes us. For we have hardly seen kids in that age-group so silent & well-behaved, they generally are un-rully, highly energetic, jumping jacks! Okay, I was pretty impressed with their cricket sense. Sachin & Sewag move aside, the more popular one is Dhoni!!! They also zapped me with Mc Grath, Inzamam, Kambli, and hold ur breath - Suresh Raina!!!!! - he was playing only his 2nd ODI that day! It was times for games.We started with 1, 2, clap-clap, 3, 4, clap-clap....kid1 says 1, kid2 says 2, kid3 shud only clap..kid4 says 4 and so on......basically check the concentration of kids....and some basic math...well, this game was not such a success. So we moved to bombing the cities!! We had Bombay, Delhi, Madras & Bangalore. The kids keep runing around - chanting 'Fire on the mountain run run run' - and when asked to stop, run into the nearest city/circle. And, one of the volunteer would call out the city to be bombed, and boom....all of them are out of play!! !One volunteer stood in each city as a pole. Soon, S***(don't recall her name) cities were bombed like hell, while Abhishek seemed not to be touched!!! Next, we wanted to play Dog & bone, but had very few takers. So, thats a challenge, getting games they like, and getting them to participate. Kurian & others got into playing cricket with some kids with a short log as a bat. It was 6ish....the volunteers wanted to get back to Bangalore....so the TCS & Infy crowd went back. And, the kids were sent for their coffee & snacks. I was waiting for the notebooks from Rohit. And that was to take sometime. So got talking with the wardens there. One of the warden was young, and he seemed to have control over the boyz. How they do it, I am not sure. But this chap looked reasonable & keen on his job. I got down to a class room session with the kids. Taught them spoken english for some 25 minutes - basic sentences etc etc - the kids were interested. But, seemed very submissive/shy, so hardly any questions from them....Then moved onto some GK. Well, I thought explaining how banks - ATM banks work - would be interesting, so showed my cards, and gave some funda's. And, then thought planes must be fascinating to them, and asked them how does an aero-plane fly ?? Well, they said 'white-petrol', and then 'fans'.....At this point, Rohit walked in carrying 150 books. And, we got distracted, and forgot the plane. Rohit, got an hang of the place & people. Some kids recognised him, for they were in the Bangalore Juvenile home, where Rohit, Sunand & Murtuza had been quite a few times. Rohit got them to multi-author online story telling. Each kid has to carry forward an online story. And, the start line was 'Ondh uralli ondh Kothi ithuu ;-)'...most exciting line for kids I wud say...'In a village lived a monkey'....well, the high school kids carried the story with a flourish, the smaller ones simply stared!!! !It soon oscilated between a shopkeeper who was chasing the monkey, and the monkey getting back at him....and suddenly, one kid 'killed' the monkey....well...some silence....whatz this, our monkey is gone....the next line came from Rohit....The monkeys ghost came out!!! !....The kids strangely protested..'How is that possible'....their warden said...'Its possible in stories!!! '.....well, I thought the kids would have just accepted such a line....and am surprised by their response....major rationality ??? or no exposure to folk tales ???? We moved on....this time it was 'Name, place, Animal, thing', 4 teams were made, each was given an alphabet and they were to come with those stuff. I wasn't keen on the idea....the kids hardly knew English is what I felt....but R persisted and got them going. Cool....we had 2 rounds...the warden said..itz time for their dinner....so we distributed the notebooks - 2 each - and for 6th std & above, we gave one more book. And, the warden insisted, that some prize has to be given....well...delicate area...there was one boy in 10th std....we declared him as the winner...gave him some more books....and the kids clapped like hell....there was another younger boy who was pretty clever & very imaginative during story telling....we gave some books to him too. At this point, Sunand, Murtuza & Dinesh walked in.....some kids recognised them.....and it was time to get back to our bus....almost 7:30....I gave a short speech...extolled them saying hardwork & a keenness to learn will take U places....the rest of the gang used to my long speeches....butted in & pulled me away!! Yes, in between a couple of times, on popular demand, I SMSed and found the scores of the match....Sri Lanka was chasing....and they were some 68/3 in the 17th over....the kids jumped & shouted....asked if Jayasurya was out....I thought hez an opener, so must be gone...the kids went delirios!!! (Well, Jayasurya apparently batted later with a dislocated shoulder & won the match). As we walked away, the warden asked...'please tell me, whatz lacking here ? '....well, suprise question...Rohit seemed to say this, 'I feel the smaller kids are a bit dull, we need to look into it'.Yes, that seemed to be true, smaller kids are always running 'bout, full of energy. But, here that was missing. And, I don't know why ?? PS: This was at the Juvenile home, KGF, Kolar on 30th July evening. Camera was not permitted. Since a lot of our members are new to the Organisation ( people who joined us for assessment, etc) , here's where you can get a broader perspective of the activities we involve in. In addition, there are Vocabulary enhancement Sessions and there is help needed at the Learning Centre. Maybe you would like to go to the school that's closest and convenient for you and get to know from the School co-ordinator, what you can help with at the school. You can leave a comment on this post and I'll mail you the numbers. As I had promised in my Bannerghatta Trip post, I could write an entire post on Suresh alone. Something he said last Saturday after the Maths assessment sessions were done interested me. All the kids had gone to the place where the food was being served, and Suresh, always the responsible one, stayed back to lock the class room door, and then dragged me to the eating area. He just washed his face, drank some water and got back to the ground. I was coaxing him to eat, and he steadfastly refused. 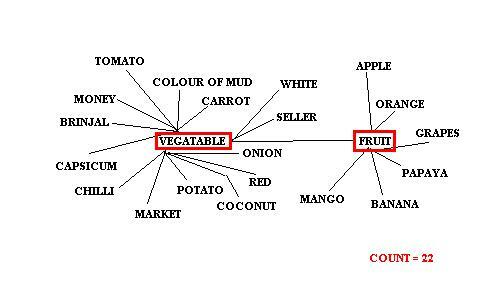 When I told him that he needed to eat if he wanted to become fatter, he came up with this line – “Yen style-kku idhudhaan correct-a irukkum” (translated to: For my style, this is correct”.) I had no response. But upon thinking later, I understood what he said. He actually has some style! A few months back, after the Republic Day celebrations, Dhimant, Megha, Vikram & I were invited to the Headmaster’s office. We were discussing about truant kids over cups of tea, when Suresh enters the room ordering a few 7th standard boys to lift a table and place it elsewhere. (Suresh is in the 4th!) After that, he puts one hand on the HM’s table, stands at an angle, crosses his legs at his ankles…and begins to give out his opinions on why the kids don’t attend regularly. Truly amazing! It was style that Rajinikanth would be proud of. 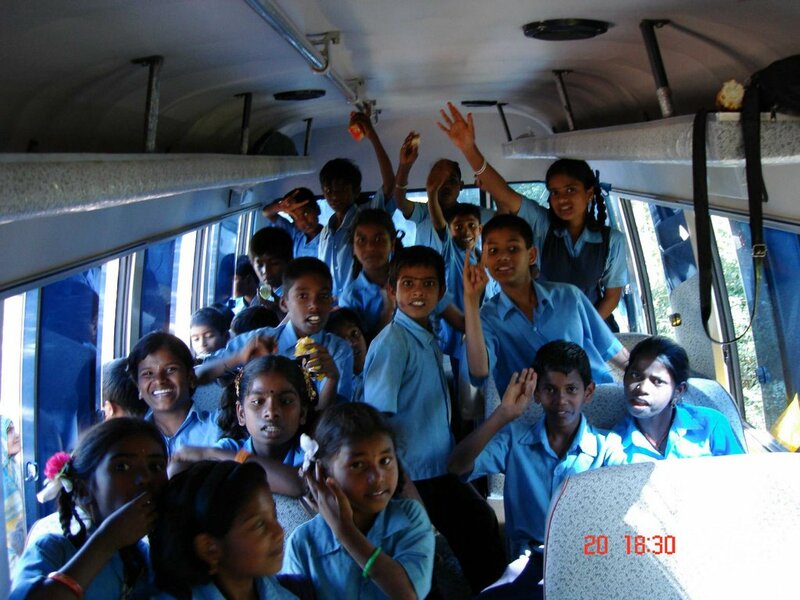 The volunteers of the Dream School Foundation organized a trip for the kids of the Thiruvalluvar Government School, Malleswaram. 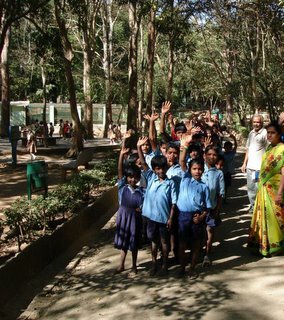 There were 65 kids in total, from classes 3rd to 7th, and they were taken to the Bannerghatta National Park. Accompanying them were 5 teachers and the headmaster, and 11 volunteers. And me being one of them (the volunteers, that is) gave me the chance to enjoy a picnic like this after a long time. Achuth, Akshai, Ameya, Anu, Dhimant, Indrashis, Megha, Pavithra, Pooja, Vikram and me. The bus ride to the zoo was an eye-opener for me. Just the initial tinkling sound was enough for the kids to guess that the song being played was Appadi Podu, and up they went in unison! And what followed after that was pure mayhem…of the good kind. Knowing the initial lines of all songs is great. Knowing all the lines of all the songs is exemplary. Knowing all the lines, and all background music of all the songs? No words to describe that! The official requester of songs from the kids was Suresh (on whom I could write an entire post…one heck of a kid! ), who forwarded his requests to “Pepsi Uma” Akshai, and I did the needful. After reaching the park came the toughest part of our job - trying to hold all the kids together and prevent them from scampering away. And surprisingly the kids behaved quite well. Perhaps not so surprisingly actually. They were staring with rapt attention at all the animals and the birds. And in the few places where the creatures weren’t clearly visible (the goddamn snakes (!!!! ), for example), one of us did a recon and managed to spot it for them. And then we were on our way back; the other bus with the same “unpleasant incidents”, and Dhimant, again, showing everyone his workplace and the bus went “oooooohhhhhhhhhhh”, and that helped things a bit. We rounded off the day with a hot cup of filter coffee at CTR, and the tired souls trudged back to their respective homes. Amidst all the fatigue, the feeling of fun never died down. It was a great day for the DSF and its kids. who plays cricket and Aakash (DSF) who is very serious in evaluation. I would like to thank God for the same. Today is Dream day March 11. I'm very very happy to join Dream School Foundation on this day. Thank you santhosh. Every success begins with a dream and a dream, in my opinion is both the inspiration and motivation we need to move ahead. So dream big and celebrate the power of your imagination on Dream Day. Catch some snooze whenever you can and escape into the magical world. And if you can't catch sleep, just dare to dream with open eyes while you share the fun with folks with some dreamy ecards. And this was a Republic Day Celebration in the Malleshwaram school ! These two boys here are among the heroes of the school. Suresh, who lives away from his parents (who returned to their village) because he wanted to continue coming to school. He's like the "Monitor" of the class, without the concept of one. He is extremely helpful to the teachers and us. Well some people, are just smart and street-smart! And there are many more.... like each of us, each of our children have a story too... you just need to prod them a bit to tell you about their lives and their dreams... and you'll have a whole new perspective to life. 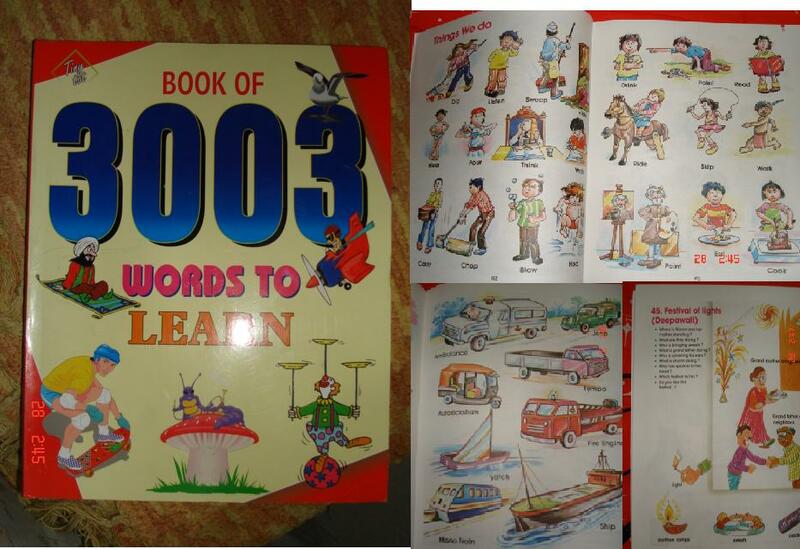 Follwoing is a story of one of the Notebook drive distrubutions that we conducted 2 years back. Incidentally that day happened to be our Independence day! This year a group of DSF volunteers celebrated the Independence Day with a difference. Led by Akash & Dharin, a group of 12 volunteers conducted notebooks distribution in 3 primary schools at the Yemmlur village. The entire gang assembled at the pizza hut, airport road where we split ourselves into 2 groups. I had Akash, Vineet, Shiva, Saurabh, Anuj and Lata in my group. After having a quick chat we mounted our bikes and headed for the schools. At the venue we were welcomed by the school Head Master who was busy making arrangements for the Independence Day celebrations. 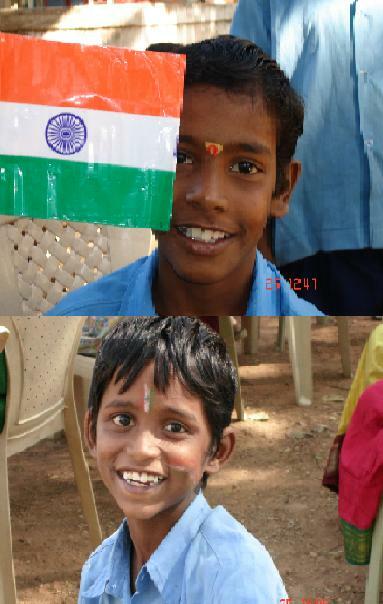 Around 150 kids with tricolor in their hands had gathered in the school compound waiting for the program to start. Their wait ended when the head master invited a village elder to hoist the flag. After the flag hoisting the entire assembly sang Jana Gana Mana...in full gusto. It was such a great feeling to sing our National Anthem after so many years!! This was followed by a cultural extravaganza from the kids. I can clearly remember 3-4 dance sequences & an equal number of group songs based on socio-religious & patriotic themes. Although I could hardly understand a word (all of it being in Kannada) but was simply delighted to see their talent & the efforts put in by the kids. It was by no standards lesser a display than any of the DPS’s or the KV's or the Convent's. It was now time to start the notebooks distribution. The head master called the kids class wise on the stage to collect their notebooks. When asked about their aim in life the kids were as ambitious as becoming a doctor, an engineer, a policeman, a soldier, a CID, a teacher & even a pilot!! They have their dreams in mind. All they need are the resources and an opportunity to realize their dreams. After the distribution was over we left the place leaving behind a group of enthused kids with their notebooks and some advice to realize their potential & their dreams!! Sweet memories of Independence Day-2004 will remain itched in my mind for a long time to come. This experience has strengthened my belief in a child’s right to education & given me a motivation for at least two things. Celebrate each coming national festival in an equally meaningful way. vital statistics of this NBD distribution. No. of Kids Covered: 210 from 1st to 7th std. In DSF, during the academic year of 2005-2006, we interacted with the 4th std kids, assessed the 2nd , 4th and 6th std kids. Going forward we will be monitoring these classes and training them. Kids drop out of school at various levels. Firstly after class 5. The reason being, the govt does not permit evaluation of these kids till then. When they enter class 6, they find it hard to cope with the competition. The other reason being, education is free till then. Secondly they drop out after class 10. This time because, probably, 1. they did not get good marks or 2. financial problems. I feel that this is the point where we can spot the intelligent ones who might lose out in the race because of lack of training. And if we are able to spot a real genius, then we could also make arrangements for his/her further studies. As we are doing with the 4th std kids now, we could take up a govt school near B'nagar, Vijayanagar etc, and talk to the principal about this idea. If he does not give us premises, we could look at other options. When we tell the 10th std kids about tuitions, only the interested will come in. And it is going to be interesting to teach the kids at that level. I have not thought about the logistics. I need all your comments on the feasibility and hurdles that might be in store. Assessment of Language and Maths skills have been completed, in 5 of our 6 schools. The results will be shared with the team shortly. Please give us your feedback (add a comment) about the whole exercise and how we should improve our next attempt at it. Recently, DSF did an assessment of it kids. We have adopted 6 primary govt. schools. And, at each of these schools (except the urdu school), students of 2nd, 4th & 6th std were evaluated. Language (Kannada) and Math skills were checked, tests were carefully designed by Megha, & Vinay, with expert support from Juveena of NEEV. This assessment would help us in knowing the kids better, and point to where we stand, & which way to go. Herz an account of it by Kavitha, a DSF volunteer, who moved out of her familiar turf to join the team at Murphy town, Ulsoor. 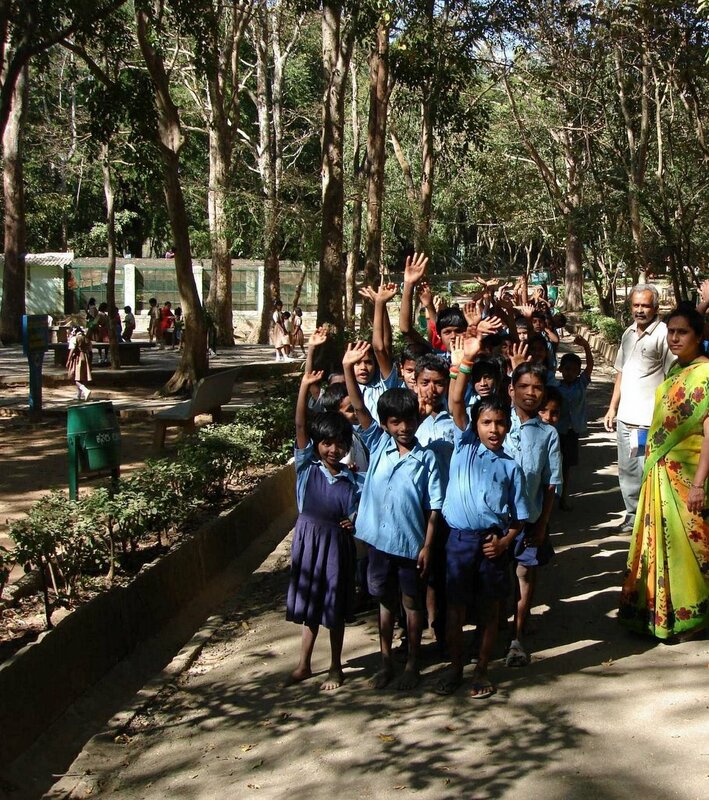 February 25th was the day set for evaluation for the kids at Ulsoor School. I wasn’t expecting anything more than a small room besides a garbage-dumping yard with little or no furniture. I had imagined a mud road with lots of potholes that would lead to this small room that might perhaps have either a leaking roof or crumbling walls. I was also concerned that the volunteers might not be able to locate this tiny little room, as there might not even be a board to display the name of the school. The auto driver who drove us to the school seemed to be well versed with the locality as he took us to the school without having to ask anybody for the directions. When we arrived at the school I was pleasantly surprised to see a single storied neat building located in a decent neighborhood. There was a board with the name of the school and that confirmed we had indeed reached the right school. Some kids peeping out of the classroom windows waved their tiny hands at us and called out aloud “aunty”. This was a welcome sign to the volunteers. The children greeted us like they had known us, though it was our first visit. We took the stairs to the first floor and I was rather too impressed with the painted boards in the corridor displaying the English months of the year, “Kaagunita” etc. The classrooms also had a few hand made charts. The two teachers in the school greeted us and informed that the principal wasn’t around. They appeared excited that their kids were being evaluated. They were very co-operative and gave us complete freedom to assess the kids in the manner that we thought was apt. They were also very enthusiastic and enquired if they could help us in any way. We assured them that we would only need a classroom for the assessment exercise and some time alone with the kids. Vishwas, Thiru and I opted to evaluate the second standard kids. Vinay and Arvind chose to evaluate the fourth standard kids. Our first task was to make the kids comfortable and not give them a feeling of being “tested” or “evaluated”. 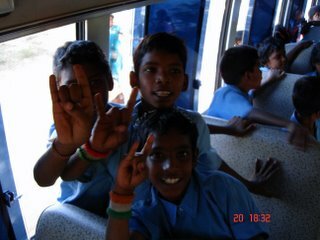 We introduced ourselves and the kids who initially seemed shy and hesitated to tell their names later sang a few Kannada songs for us! They only needed a couple of minutes to feel comfortable and then they were their bubbly, cheerful selves again. The people in the neighborhood were celebrating a festival and a loudspeaker was blaring loud music. The children seemed to be least disturbed with this. It appeared to me that they were so accustomed to such disturbances they had learnt to live with it. The teachers expressed their concerns about such disturbances occurring frequently. Their repeated requests to reduce the disturbance didn’t seem to have much effect on their neighbors. They had requested the neighbors to turn down the volume of the music when the “volunteers” would be evaluating. But the neighbors felt it was more important to celebrate the festival with loud blaring noise than children learning to grow up to be responsible citizens contributing to the welfare of the society. But this did not deter either the teachers or the children. The teachers wanted their children to learn new things. Dedication in teachers is a rare quality even in some private schools. But this seemed to be in abundance with the teachers in this little known school at Ulsoor. 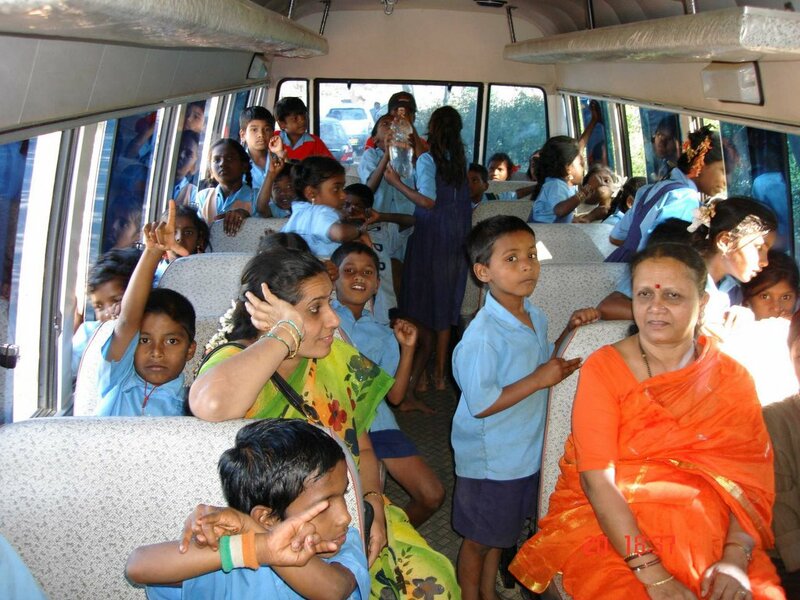 Teachers in Malleswaram Government School sometimes personally go to the kids’ homes and bring them to school. I asked another girl “ ‘Aa’ inda shuruvaago yaavdaadroo ondu pada helu putti” meaning “tell me a word that begins with ‘Aa’ “ she sang a song that begins with “Aa” :-)) Apparently the kids cannot differentiate between “word” and “song” as the word “pada” means “song” or “word” in different contexts. I pointed to the word “Rajanikanth” on a flash card, to a kid and asked him to read it. He was struggling to identify the alphabets and I turned the flash card and pointed to the picture of “Rajanikanth” on the other side. He smiled and said “PASHA” or perhaps it was “Basha”??? 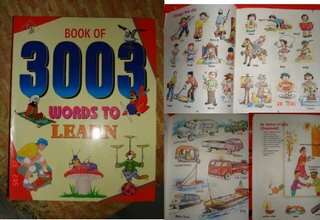 We then asked the kids to read a sentence from their Kannada textbook. One sentence read “avaLu ondu dhoni maadidaLu” meaning “she made a boat”. When Vishwas asked a kid what it meant, the kid very innocently said “cricket-u, dhoni”… J . Apparently the kids thought Dhoni referred to the Indian cricket player Dhoni!!!! Language did not seem to be a favorite subject with the kids. 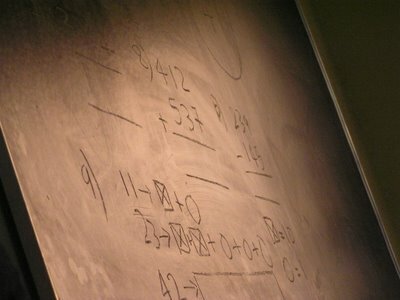 So it was now time to move on to the next subject Mathematics. Most kids dread mathematics. They do not get the fundamentals clear in their elementary school and it wouldn’t be surprising if these kids didn’t fare well in this subject. I wasn’t expecting them to fare well either. I announced “sari eega ellaaroo lekkha aata aadanva?” meaning “shall we all play a game in mathematics?” I was expecting a couple of kids to groan or make it evident they didn’t like what they heard or look disinterested. How wrong I was! 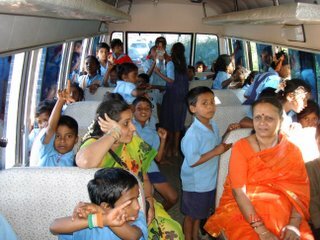 The children smiled and very enthusiastically said “sari. Naanu barla aadakke?” meaning “Ok. Shall I play?” almost instantaneously. We finished our evaluation exercise with the second standard kids and helped Vinay and Arvind evaluate the fourth standard kids. The kids could all read simple alphabets, but they had some difficulty reading the compound characters (othakshara). Also their comprehension wasn’t very good. This definitely causes some concern. If they are not good in Kannada, which is the medium of instruction, they cannot learn the other subjects like social science well. It didn’t surprise us that the girls fared better than the boys. There could be a Kalpana Chawla, Shakuntala Devi, Sudha Murthy, Indira Gandhi, Arundathi Roy or a Kiran Bedi among these kids. I would have loved to stay a while longer and find what they dream about. But a glance at my watch said it was time for the kids to have their afternoon meals. We distributed chocolates to the kids, waved bye to them and returned home. Volunteering with Govt. primary schools is a lot of fun. Kids from 1st std to 7th std. Shy & Cheerful faces, calling you 'Uncle', 'Aunty', 'Anna', 'Akka', 'Sir', 'Miss'. Childhood stares & smiles at you. Itz Heaven. Help the kids realise their dreams and keep their smiles on. Interested ? write to Mrs Maitreyee, our DSF co-ordinator. 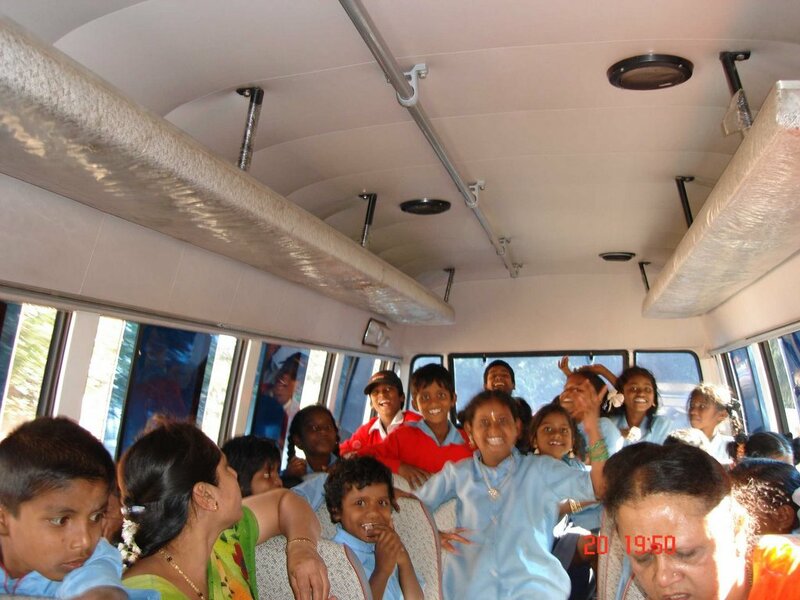 Dream School Foundation emerged as an Organisation with a distinct vision and some committed volunteers. Our Vision, is to mobilize communities to improve the standard of public education system. Our Experience is through our volunteers, mostly working professionals, who share our Vision. Our Inspiration, Mrs. Maitrayee Kumar. The Dream School Forum is our space to communicate and to enhance the Foundation's strength. Please do make use of this space to express your thoughts and feedback on DSF's efforts and activities.